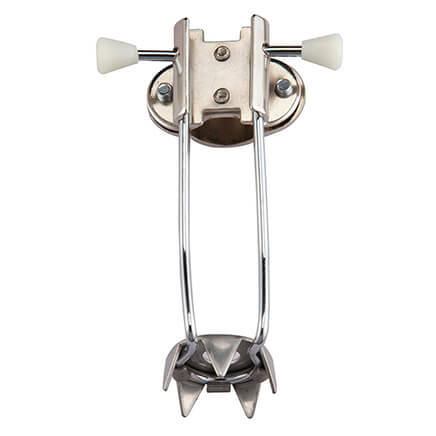 Add 2 Folding Canes to Cart, Get $2 Off each! Great! Both product and price. I have other canes, but decided if I had to use a cane, I wanted a pretty one. This one fills the bill. For the price, I wasn't expecting it to be this well made. I don't fold it now because I am always using it, but if the time comes that I can do without it, I will fold it and put it in its carrying case for storage. I am very pleased with this cane and have found nothing wrong with it. I may order another one. I use this product when I go to the store or just for a walk. I find it very good. My knee and hip are undependable, so I purchased the cane to help me get around; it is doing that well and is very portable. This is a cane that is sturdy, attractive, and well made. 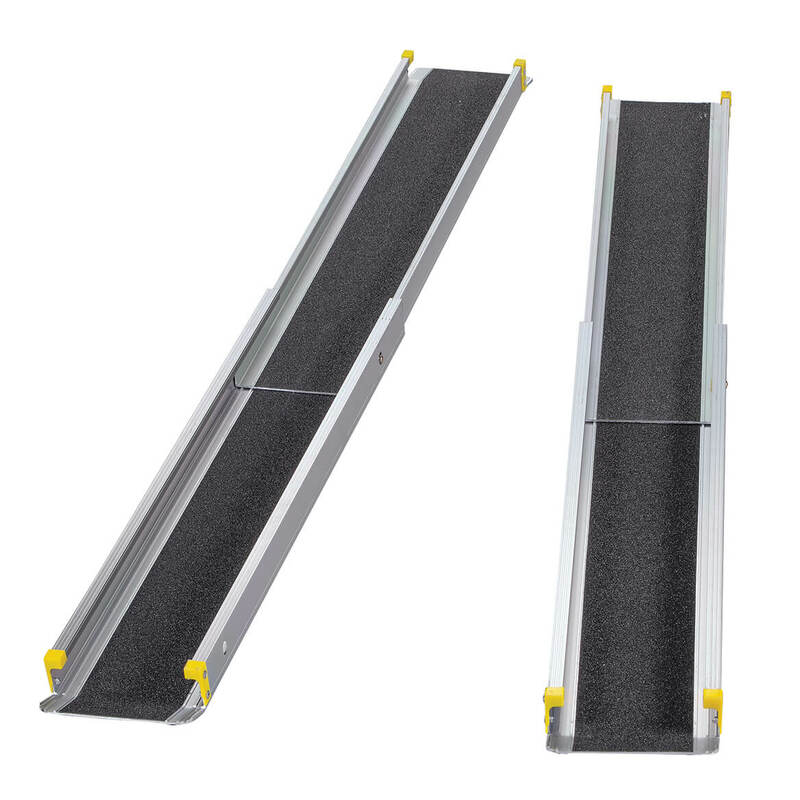 It is adjustable, and it folds up when needed to get out of the way. Haven't taken it for a test run yet. Like the color & ease of it though. The folding is good for traveling. i will buy another one when i can. 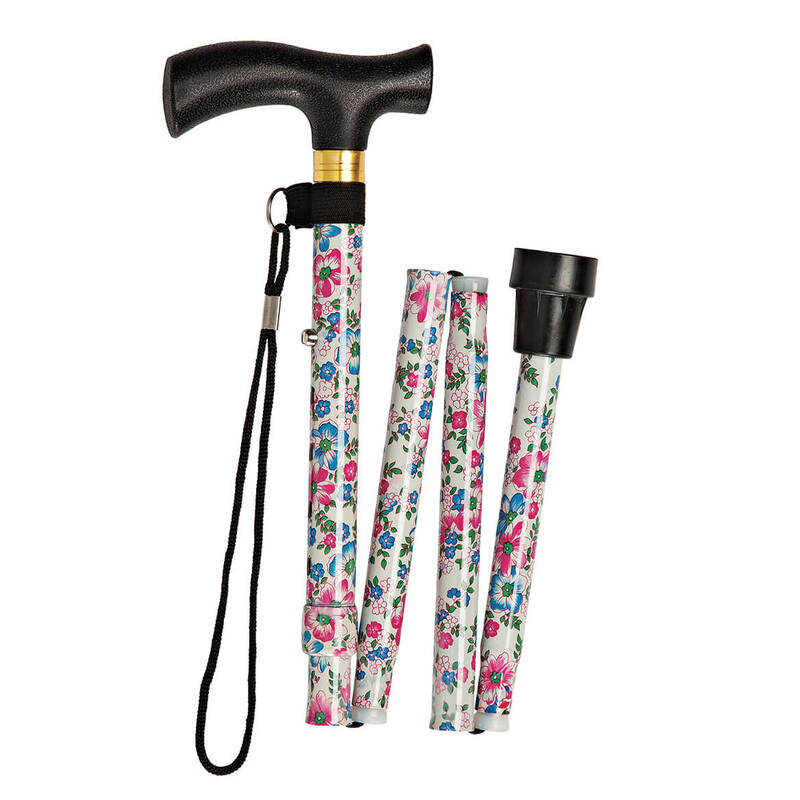 i like this short handle cane because it's more light weight and easier to walk with. Very light weight and pretty as well. I am so glad to find a cane that looks fashionable yet serviceable. I am not at the age to were I want to look like and elderly lady with a cane. It's so cute. I love it. Great Price as, well. Thanks! the cane is very sturdy to use for support, made very well, unfolded very quickly when i opened it. We both use this cane and take it everywhere. Love the color and design. Many strangers have remarked about it being so "stylish". I love how easy this cane is to fold down and then to put back together. I needed a folding cane for when we go someplace and I need to get out of my wheelchair and walk. Folded, the cane fits easily in the pouch of my wheelchair. The colors are very attractive. 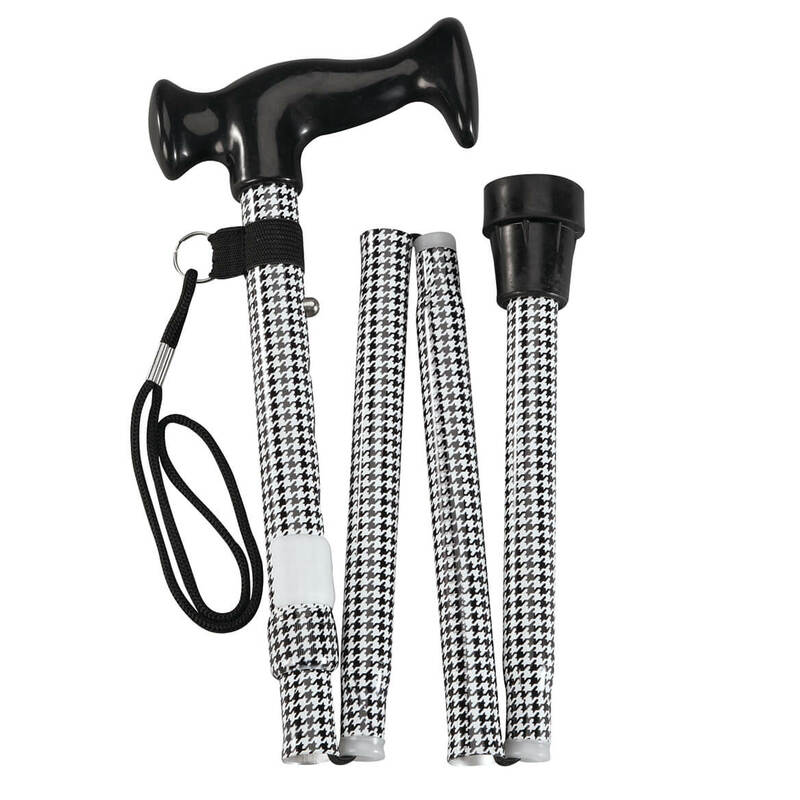 This collapsible cane will be handy for travel and for when it's not needed. It folds so you can put it in a tote bag when travelling. I returned the item only because I was given one just like it. Unsteady on your feet? Might as well look cute! i had a trip planned for Hawaii and wanted to take some kind of cane. This one is so lightweight and FOLDABLE so I can tuck it in the front seat pocket. 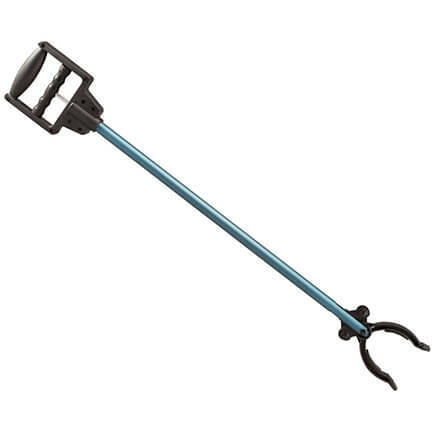 It has an easy to grip handle, it amazingly steady, but best of all, ADORABLE ! The black background covered with colorful polka dots means I can use it with any outfit and still be stylish! One last great thing is the cost. I searched on the web and there was nothing in this price range that was even close to Walter Drake's cute foldable cane. Just got the cane. Easy to adjust the height. Because it is folding, I can put it in the seat pocket on the airplane. I selected the polka dot pattern which is lively and interesting (and matches my rain boots)! I have to use the cane for balance reasons. I do like to have something more exciting than just a plan black cane. This poka doted one is great. I feel a little more in fashion even though I am a little old woman. Thank your for the great design. Had tocut off three inches as I am short but works well with the heavy duty base. Really going to work on the plane. It is a colorful yet sturdy cane. I can fold it and store it in my bag when not needed. Great to carry on a walker to use in going into a restaurant or areas where it isn't easy to store the walker at your seat. Using a cane can be such a blow to one's ego. 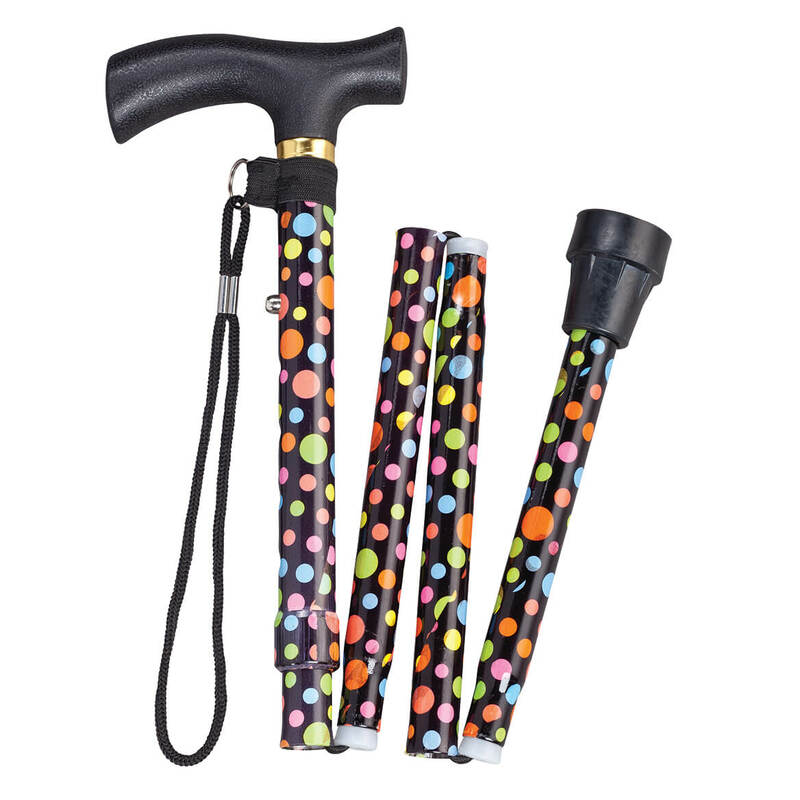 This pocka doted cane adds some life to the situation and proclaims "Look at me. I find enjoyment everywhere." Wish it had some kind of "locking system" when it's collapsed. Would be so much more convenient to tuck in purse or tote, or lay under chair when seated. It works but doesn't want to stay folded up. It supports my weight, but I bought it because it folded and that isn't working well. FOUND THESE CANES VERY FLIMSY, THEY BOW AND BEND WHILE USING THEM. MY FIRST BAD PUCHASE. I have one and needed some more. They work great. Useful, unusual and attractive designs (esp. polka-dot). May as well be stylish and cheerful while needing a cane! I HAVE ONE ALREADY AND IT IS SO CONVENIENT WHEN I AM SHOPPING TO JUST FOLD AND PUT IN MY PURSE OR CART. I LIKE THAT I CAN GET DIFFERENT ONES TO MATCH WHAT I AM WAREING. The nicest items at good prices and of good quality! Pretty and it folds up. My regular cane is always in the way at restaurants, etc. Have had a knee replacement and need a cane. Like that it folds up and could be put in a suitcase when travelling. Getting to a point that I may need one. I HAVE A BLACK ONE BUT IT HAS HAD SO MUCH USE I FEAR THE ELASTIC MAY BE WEARING OUT. BOUGHT THIS FOR RESERVE WHEN THAT HAPPENS. CANNOT BE LEFT WITHOUT A CANE AND LOVE THE STYLISHNESS. 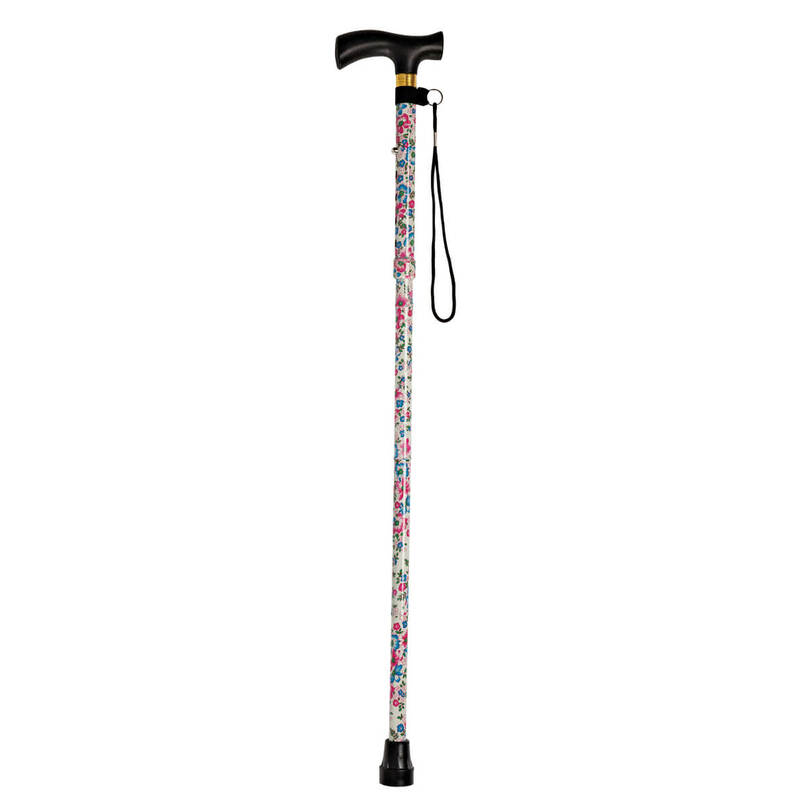 More convenient when travelling instead of the usual size/style walking cane. Been wanting a folding cane and loved these styles. Going on Vacation and needed the folding cane for easy transport and convenience. looks easy to carry with me, in case. I needed some extra support while on a bus trip for site seeing and walking on uneven ground. My balance/unsure of my footing is not the best. Wanted a "third Leg" to stand on if needed. I like the fact that it folds to fit in a suitcase or back pack. I need a cane for balance and these are pretty. I have used a walking cane for 16 years. I like to varity of canes. NO old black. Thought about if I wanted an upscale cane, but then I'd have to go to an upscale bar for anyone to appreciate it! Think I'll just be myself and get these budget canes and be happy! 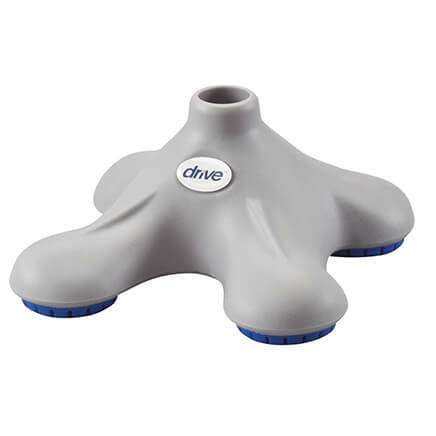 Plus, just saw these same ones (or similar) at the drugstore for $20. So, I bought two here! I am in need of a new cane and I would like to try the foldable style. 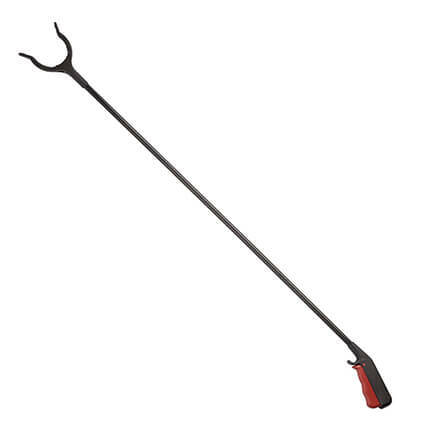 I needed a good sturdy travel cane and had one of these before and I lost it. So glad you carry this easy to use folding cane. Thank you! I need something that will help me feel more secure when I walk a distance. A folding cane is easier to take on a trip. The price is lower than other places. The canes are attrective. My sister shared he catalog with me. I needed a new cane and this one was so pretty. Same item is in a local store known for low prices.But it's price is $5 more. I have always shopped Miles Kimball and their items will last a lot longer than most items of same quality. They are a great shopping source ! 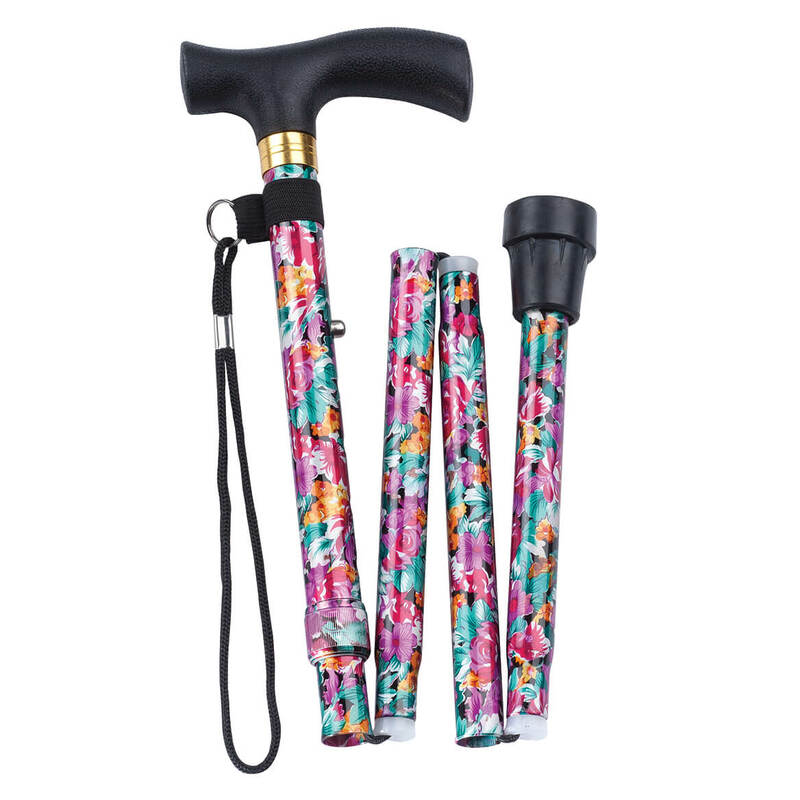 I purchased the folding canes for my mother. I wanted one to fold in my purse when I don't need it. I need a cane on occasion, so why not show your patriotism at the same time? I like this kind of a handel. What is the length when completely folded? BEST ANSWER: Thank you for your question. Height adjusts 32 1/2 - 37". We hope this information will be of help to you. When the four sections are laying side by side in the folded down stage as illustrated; what is the length of the longest piece. This way I can determine what the length is when the item is folded, not the adjustable length when put together. What size is the cane circumference around? BEST ANSWER: Thank you for your question. The circumference is about 2.36". We hope this information will be of help to you. The cane is almost 3" around and the rubber tip at the bottom is 4 3/4" inches around.